I just read a great blog post called "The 5 Best Toys of All Time" by Jonathan H. Liu at Geekdad. The toys? Yesterday my 13 year old son spent the better part of an hour shaving the bark off of a stick with his pocket knife. Meanwhile, the little girls (ages 6 & 3) were arranging smaller sticks into a pattern to decorate the front stoop. My 10 year old son loves to stab a box over and over again with a pencil, covering its surfaces with puncture holes. The children have enjoyed many hours of play with "kites" made from a plastic grocery bag tied by the handles to a piece of string. They also like to tie string to door knobs and extend it across space to desk legs, drawer pulls, or other door knobs. The little girls have discovered that if you get a toilet paper tube wet, it will separate into two diamonds of brown cardboard. A paper towel tube, on the other hand, is just one long skinny diamond. Either way, they religiously turn all of our empty tubes into these unlikely jewels. For an entire school year my boys' obsession was their "digging club". Members of the digging club spent all of their outside recess time creating and enlarging a particular hole in the ground, using sticks as tools. At home, they worked on a hole in the middle of our lawn, which their dad later made them fill in. The Nichols Arboretum here in Ann Arbor has designated a certain grove of pine trees (near the peony garden) as a fairy wood. Children and adults go there and build the most spectacular miniature structures and gardens with sticks, pine cones, pine needles, rocks, flower petals, bark, and leaves. We spent a glorious afternoon there this past spring admiring what others had built, and trying our own hands at fairy building. And finally, I would like to put a plug in for bringing these toys home as gifts when you travel. A few years ago we were vacationing in San Diego sans les enfants. I was trying to decide what I would bring them as presents. I kept noticing beautiful flowers, leaves, seed pods, and other bits of nature littering the ground that were nothing like the things we find in Michigan. I thought how much the kids would love to see some of those things, but I ended up bringing home an obscene amount of candy instead. The next time we went away (to Florida this time), I brought home a much more modest amount of candy, as well as some shells we had found on the beach. Now I have started collecting shells, rocks, and pretty bits of wood whenever I go on vacation. I have a lovely little collection on my dresser, and it brings me a great deal of joy. Since the girls always want to play with my collection, and the 3 year old has already broken three of my favorite shells, I brought home a much larger collection of rocks from our vacation to Lake Michigan in June. I put my favorites on my dresser, and put the rest outside in a pile in our yard. I have been pleased to find the girls doing all kinds of creative things with those rocks, the sight of which brings back extremely pleasant memories of our trip. If you are interested in making such things a greater part of your child's life, you can find some great images and ideas of things to do with rocks and sticks on my pinterest board "Even I Could Make This." Enjoy! Our dryer broke a few weeks ago. It still spins, but the heat doesn't work, so it takes things the whole day to dry. The repair people can't come until Thursday, and we were drowning in dirty laundry. It finally (after a week or so) occurred to me that we could put up a clothes line outside and dry our things the old fashioned way. Dan put the clothesline up for me on Saturday, and even though he was feeling sick, he did several loads of laundry for me. I took over at the end of the day. When I first went outside and started undoing the clothespins, a wonderful happy nostalgia came over me. When I was a missionary in the Philippines, many, many years ago, I spent about a year hand washing my own clothes, sheets and towels with water that I had to draw up from a well with a bucket. I poured the bucket of water into a big plastic washtub on the cement patio in our back yard, squatted down, and washed each article by hand. On good weather days, I could hang my wash to dry outside and it would be done in just an hour or two. The rest of the time, when it was rainy or super humid, we hung our clothes inside and pointed our fans at them to try to get them dry. It could take days, and they would often get a moldy smell if we couldn't keep the air moving enough. It has been so many years since that time in my life, I had almost forgotten that I ever did laundry without a washer and dryer. Going out to the clothesline Saturday, Sunday, Monday, and again today, has been the nicest feeling. Granted, the weather has been perfect for doing laundry--sunny, breezy, not too hot, not too cold. It feels so good to take a piece of wet laundry from the basket and attach it to the line with two clothespins, one at each corner, stretching it just right so that it will dry quickly but without leaving the item misshapen. It feels good to move on to other work, knowing that the sun and wind are drying my laundry. It feels good to come back find that each item is has dried, and remove it from the line, and then start over again with the next load. I'm glad my dryer is broken. I'm glad for this reminder that the sun and the wind can dry our laundry, and for the pleasant feeling of this form of work. I'm grateful for the memories the clothesline and clothespins bring me of a time in my life when I felt a deep connection to my ancestors as I brought water up from the ground, poured it into a tub, scrubbed my things, and hung them out to dry. Instead of searching through your possessions for things you are willing to get rid of, select the treasures that you absolutely would not want to live without. Then get rid of everything else. I tried this on one bookcase in my living room a few weeks ago. My first time through the books, I looked for those that I was ready to part with, and came away with three titles. The second time though, I selected my absolute favorite books and set them aside--there were fifteen to twenty titles in that pile. As I looked at what was left on the bookcase, I realized that I wouldn't really miss any of it. I cleared two big boxes of books out of my house that day, instead of the initial three volumes. That experience really opened my eyes. I was surprised at what a difference it made to identify treasures instead of trying to pick the things that I didn't need or want anymore. Francine Jay insists that you must physically clear the entire space you are trying to sort through before making your choices, and then only return the things you love to that space. I have not tried that yet--I'm pretty sure I would dump everything on the floor, where it would stay for another year or two, unsorted and trodden upon. Jay says that when you clear a space and see how lovely it looks empty, it is harder to put things in it that you don't really love. When the space is full, it is easier to believe that everything in it belongs and deserves to be there. When I go on vacation, I typically pack 5 outfits, a few books, and a few toys for each child. I am amazed at how easy it is to do laundry, to gather our things, to tidy our room, when we have so few possessions. Then when I get home I wonder why we have so many clothes and books and toys that we can obviously live very happily without. When I'm packing, I tend to choose my favorite things. I think Jay's method of living with less is similar to packing for a trip--choose your favorite things and then get the rest out of your house and out of your life. My week of stay-cation is coming to a close. Dan and the children will be back from their East Coast road trip this evening. I had two main goals while they were gone: 1) finish grading the papers that were the reason I stayed home in the first place; 2) bring a bit more order to the swirling mass of chaos that is our home. In addition to these two pursuits, I enjoyed quiet *uninterrupted* visits with friends, daily *uninterrupted* naps, eating mostly cookies and Easter candy all day every day (a bit sickening, but still), daily walks, the ability to concentrate, and a virtually empty calendar. Each morning when I awoke, I could feel myself sneaking around the house, hoping for a few moments to myself before the children woke up. Then I remembered, turned on all the lights, and made as much noise as I pleased. After an entire week, the dishwasher is still not full, but I ran it this morning anyway. I can see the bottom of the dirty laundry hampers, and I have even washed the extra towels and bedding which have waited for months at the bottom of the pile while more pressing things (like underwear) get washed first. I have a hard time understanding people on the phone, especially my children. This makes me want to avoid calling them when we are apart. So I decided that for this week, we would try to communicate via email. I tried to send them an update each day of what I was doing, and they sent me frequent messages as well. I really enjoyed that. Some of the major projects I have worked on: moving the computer and printer from the basement to the kitchen. Moving the kitchen table from the kitchen to the dining room. Moving the desk from the dining room into the kitchen and putting the computer and printer on it. Clearing off and getting rid of the bookshelf and dresser full of junk in the dining room that were supposed to help me keep everything looking neat and tidy. Moving the bookshelf from the dining room into the girls' bedroom, and moving the too-small bookcase from their bedroom into the entryway. I am very happy with my new kitchen-office. It makes so much sense to have all of the major tools I use during the day together in one room. I have cleared out one bank of kitchen cupboards to house office supplies. I also love having the kitchen table out in the dining room because it is so sunny and bright there, and now the kitchen feels much less crowded and crazy. I have also been gathering toys from all over the house and trying to sort and put them away. They don't really have a home. I'm never sure if I want them to be in the basement or in the girls' room. In either case, there is no toy shelf for them. Maybe this is why they are always all over the floor? This is a project I need to finish today, so my gathering and sorting will not be in vain! I also need to fold and put away the giant mountain of laundry I have piled up on Esther's bed in her absence. And I'm going to have to start thinking about cooking and eating real food again. The cookie-Easter candy-occasional-take-out-meal-from-a-restaurant diet may not be the best way to feed a family of 6. Living alone has been so easy. When the family returns tonight, they will bring a big load of stress with them, as well as several big loads of dirty laundry. One of the most stressful part of raising 4 children for me right now is also one of the most basic: keeping them fed. During the 2.5 short weeks that we had a dog, I loved how easy it was to feed him--just pour 1/2 cup of dry kibble in his bowl twice a day and he was good. Feeding little humans is much harder! I think I make it much harder than it needs to be by fighting it. I put it off, avoid it, and it hangs over me and follows me around all day, whining. I'm hoping when the kids get back I can make some progress in the direction of accepting and embracing this responsibility, keeping on top of it, or even ahead of it. Same with keeping them clothed. I think a lot of my daily stress and misery would be eliminated if I would focus on feeding and clothing the children in a more determined, mindful way. When I try to run away from the necessity of repeating these tasks over and over again, there is the nearly daily unpleasant surprise that someone is completely out of underwear or socks, or that someone has poured milk on their cereal but there are no clean spoons. I think this wears on me much more than just accepting the fact that I need to do dishes, laundry and meal preparation every day forever and ever, even if I don't want to. As I've seen this week, I can get away with only doing those tasks once a week when I live alone, but I do not live alone. And I am glad I do not live alone--it is a blessing to have a house full of children and a nice husband. But if I want to be happier, I need to stop avoiding the necessary daily repetitive work that must be done. Well, that is my lecture to myself for the day! 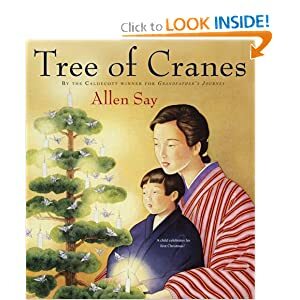 Tree of Cranes by Allen Say: a Japanese mother surprises her young son by teaching him about Christmas. 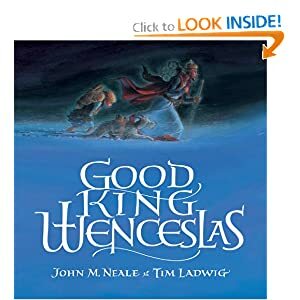 Good King Wenceslas by John M. Neale & Tim Ladwig: Esther wanted me to read this one every night. It is the lyrics of the classic song set to illustrations. She preferred the sung version. 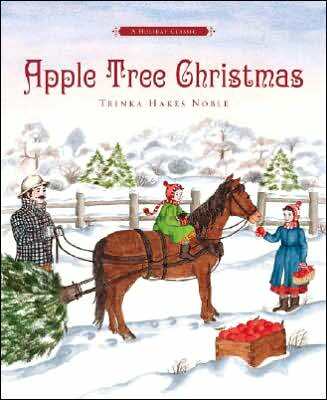 Apple Tree Christmas by Trinka Hakes Noble: A story of a young artist and the winter she realized how well her father knew and loved her. My Prairie Christmas by Brett Harvey & Deborah Kogan Ray: a pioneer family's first Christmas on the prairie, away from their family in Maine. Reminiscent of Laura Ingalls Wilder. 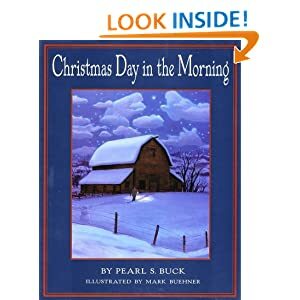 Christmas Day in the Morning by Pearl S. Buck and Mark Buehner: The story of a 15 year old boy and how he first realized his father loved him and tried to give him a gift to express his love back. 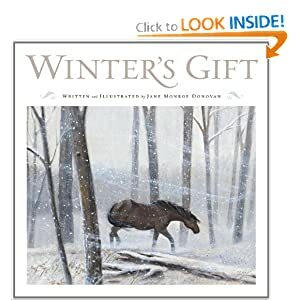 Winter's Gift by Jane Monroe Donovan: a widower's first Christmas alone and a miracle of love brought by caring for a wild horse. 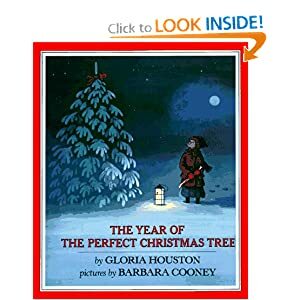 The Year of the Perfect Christmas Tree by Gloria Houston & Barbara Cooney: A little girl and her mother do their best to prepare for Christmas while the father is away fighting in WWI. 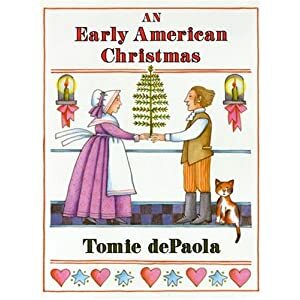 An Early American Christmas by Tomie dePaola: a German family brings many new Christmas traditions to a New England town. 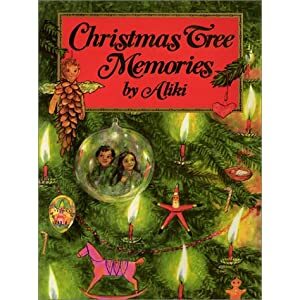 Christmas Tree Memories by Aliki: a family gathers around the tree on Christmas Eve discussing the memories sparked by each of their Christmas ornaments. The other night Dan expressed his concern for me and his desire to help me. I was taken off guard because I had not been feeling down-trodden or bad about myself. I analyzed the situation and realized that the house was a mess, I hadn't been keeping up with the dishes, our dinners were of the boxed variety for the most part, and I'd been staying up really late reading and doing Pinterest. Normally, these behaviors would signal a sad Potato Girl in need of help. So why did I not feel that way? Why did Dan's concern seem surprising and somewhat unnecessary? I have actually been feeling like Wonder Woman lately because I'm still following my new diet. Every day I make many small choices to continue this diet. They are not easy choices for me to make, and I've been making them consistently without flubbing up for...well, today is day 25. I'm pretty sure I've never gone this long without sugar, bread, fruit, milk, yogurt, cereal--basically, all of the things I normally eat. Today is Adam's birthday. For several years now I have made him Rice Crispie treats to take for his class. I asked him the other day if we could please just send in a store-bought treat this year so I wouldn't have to handle all of that yumminess. But this was really, really the only thing he wanted, so this morning I made them. I had the stuff all over my fingers and I did not have a single little lick. That makes me feel good about myself, and I don't often feel that way. One of my diet books says that you need to give yourself credit for all of your little successes. Dan and I thought that was kind of cute, so we have a habit now of saying to each other, "you deserve credit for that!" It makes us laugh because it is such an awkward, unnatural-sounding thing to say, but at the same time it feels good to recognize those little choices. I do think it makes sense to celebrate and acknowledge all of the small choice you make instead of waiting until you've lost 50 pounds to give yourself any praise. I think a difficult lifestyle change is more sustainable if you recognize all of the little daily things that are going into it, like not licking your fingers when you are making a dessert. One idea that has been helping me has been thinking of carbohydrates as alcohol, coffee, tea, or tobacco--something that I am absolutely prohibited from even having a tiny taste of. Following the Word of Wisdom my whole life is now making this diet easier for me. This is the first time I've had myself treat sugar as a completely off limits item, but that seems to be a lot more sustainable, in the long run, than having little bits of sugar and trying to not go too far. If I think of myself as a recovering addict trying to stay sober, I can see that "one little bit" of my addictive substance is all it will take to get me back to a place where I'm no longer in control of myself. Feeling in control of this aspect of my life gives me a great sense of success and well-being. So I think this explains why I was not feeling bad about myself or lost or down in the dumps when Dan thought I was. Take home message for me: if I can focus on one small positive change, and really work on it each day, and give myself credit for the efforts I'm making, it can help me feel good all around, in spite of the fact that there are many other changes I want to get to but can't yet. She laid a quilt on the ground, and there she placed her infant son in the care of her three-year-old, Roy, and five-year-old, Ada. 'Hold little brother ’til papa comes for you,' she said. Then positioning herself behind the wagon, Belle Smith grasped the reins of the horse hitched to the back of the rig. Stanford started the team down the hole. The wagon lurched downward. With the first jolt the rear horse fell. Sister Smith raced after him and the wagon, pulling on the lines with all her strength and courage. She soon fell too, and as she was dragged along with the horse, a jagged rock cut a cruel gash in her leg from heel to hip. That gallant woman, with clothes torn and a grievous wound, hung on to those lines with all her might and faith the full length of the incline all the way to the river’s edge. The second story President DeVries told this morning was again related to his recent severe burns. One of his doctors told him to point and flex his feet as many times as he could each day. When President DeVries tried this the first time, he felt a deep stab of pain and started bleeding profusely. He stopped, unsure if the doctor knew what he was talking about. He did not trust him, and could not bring himself to continue the exercises. Soon another doctor came to see him. This doctor is President DeVries' close friend, and one of his counselors in the Stake Presidency. He asked his friend about the exercises. His friend agreed with the first doctor that this was vital for the proper healing of his feet and legs. Because he trusted his friend, President DeVries started to do the exercises and continued them faithfully until they were no longer necessary. "Wherefore, ye must press forward with a steadfastness in Christ, having a perfect brightness of hope, and a love of God and of all men. Wherefore, if ye shall press forward, feasting upon the word of Christ, and endure to the end, behold, thus saith the Father: Ye shall have eternal life." He said that because of his trust in his friend at the hospital, he had the perfect brightness of hope he needed to press forward in the agonizing exercises. Sister Arabella Smith was steadfast, firm in purpose, unwavering in her determination to pull back on that rope so that her husband, the team, and the wagon could make it safely to the bottom of the cliff. He asked us to think of these stories as we sang the closing hymn, asking the Lord to help us see one small step we can take to press forward now. The step Dan and I took this afternoon was to get out the calendar and schedule together which days we will go to the temple for the last three months of the year. That felt really good. I want to be like Belle Smith. I want to hang on for dear life to the people and principles that matter most, and I want my family and friends to be able to say that I was the help they needed. I hope I won't forget that story. Could You Spend a Year Buying Nothing New?